Meteorologist Amy Freeze has the updated forecast from AccuWeather. NEW YORK (WABC) -- It will be cloudy on Monday with a few showers around. East of New York City could see some steady PM rain. Here's the 7-day forecast for the immediate New York City area. A few showers with a high of 68. Sunny and warmer with highs near 76. Sun and clouds with a high near 65. Showers and a thunderstorm with highs near 66. A few showers with a high near 66. 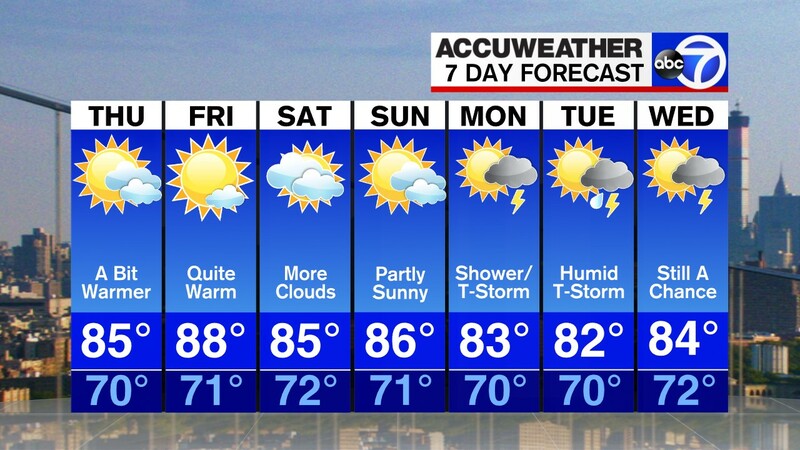 Click to watch the 7-day AccuWeather forecast and get all the weather any time at abc7NY.com/weather. For weather updates wherever you go, please download the AccuWeather app.